So what are the problems of relying too heavily on stories? …I think of a few major problems when we think too much in terms of narrative. First, narratives tend to be too simple. The point of a narrative is to strip it way, not just into 18 minutes, but most narratives you could present in a sentence or two. So when you strip away detail, you tend to tell stories in terms of good vs. evil, whether it’s a story about your own life or a story about politics. Now, some things actually are good vs. evil. We all know this, right? But I think, as a general rule, we’re too inclined to tell the good vs. evil story. As a simple rule of thumb, just imagine every time you’re telling a good vs. evil story, you’re basically lowering your IQ by ten points or more. If you just adopt that as a kind of inner mental habit, it’s, in my view, one way to get a lot smarter pretty quickly. You don’t have to read any books. Just imagine yourself pressing a button every time you tell the good vs. evil story, and by pressing that button you’re lowering your IQ by ten points or more. I believe this is a better way of thinking about stories. It may be true that embedding information in stories generally leads to oversimplification or avoidance of uncertainty. On the other hand, plenty of stories can be nuanced and accurately relate complicated information. But even if storytelling does sacrifice something, it gives us the ability to digest and remember information much more quickly and easily. And the fact is that, in practice, most of us are working with very limited resources (most notably time). We need all the help we can get to process information. If stories can help, that’s generally a good thing. Yet, I generally agree with Cowen’s point about stories that seem too convenient (especially Michael Moore movies!) But I’d like to propose that, rather than setting up a mental filter to resist certain types of stories, we focus our efforts on the evaluation of the sources of those stories. Here’s where trust and credibility come in. When Kahneman says he’s going to tell me a story about two characters that make up the mind, I trust that he won’t mislead me, that he won’t overstate his case, or eschew complexity so completely that I’m left with a misguided impression. I believe that he’s trying to help me get a basic grip on very complicated information as best he can given the time I’ve allotted to learn it. That’s because he comes recommended by lots of thinkers whom I respect, and because he’s extraordinarily well credentialed. I find him credible and so I trust him. I’d urge us all to spend more effort evaluating who we trust – whose stories we’ll buy and whose we’ll treat with Cowen-esque skepticism. And perhaps one metric for assessing credibility would in fact be to apply Cowen’s criteria (does so-and-so constantly tell black-and-white stories?) This seems a more promising path. 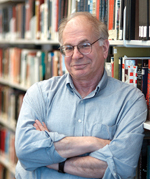 After all, at this point if either Cowen or Kahneman told me a good vs. evil story I’d believe him. It is of further theoretical relevance that the self-affirmation manipulation used in the present research and the identity buffering it provided exerted no effect on open-mindedness or willingness to compromise in situations heightening the importance of being rational and pragmatic. This lack of impact of selfaffirmation, we argue, reflects the fact that the identity-relevant goal of demonstrating rationality (in contrast with that of demonstrating one’s ideological fidelity or of demonstrating one’s open mindedness and flexibility) is not necessarily compromised either by accepting counter attitudinal arguments or by rejecting them.Both responses are consistent with one’s identity as a rational individual, provided that such acceptance or rejection is perceived to be warranted by the quality of those arguments.The pragmatic implication of the latter finding is worth emphasizing. It suggests that rhetorical exhortations to be rational or accusations of irrationality may succeed in heightening the individuals’ commitment to act in accord with his or her identity as arational person but fail to facilitate open-mindedness and compromise. Indeed, if one’s arguments or proposals are less than compelling, such appeals to rationality may be counterproductive.Simple pleas for open-mindedness, in the absence of addressing the identity stakes for the recipient of one’s arguments and proposals, are similarly likely to be unproductive or even counterproductive. A better strategy, our findings suggest, would be to provide the recipient with a prior opportunity for self-affirmationin a domain irrelevant to the issue under consideration and then(counterintuitively) to heighten the salience of the recipient’s partisan identity. …You may contend that these results show only that some people just happen to have more willpower — and know that they do. But on the contrary, we found that anyone can be prompted to think that willpower is not so limited. When we had people read statements that reminded them of the power of willpower like, “Sometimes, working on a strenuous mental task can make you feel energized for further challenging activities,” they kept on working and performing well with no sign of depletion. They made half as many mistakes on a difficult cognitive task as people who read statements about limited willpower. In another study, they scored 15 percent better on I.Q. problems. Yet social psychologists Aronson, Fried, and Good (2001) have developed a possible antidote to stereotype threat. They taught African American and European American college students to think of intelligence as changeable, rather than fixed – a lesson that many psychological studies suggests is true. Students in a control group did not receive this message. Those students who learned about IQ’s malleability improved their grades more than did students who did not receive this message, and also saw academics as more important than did students in the control group. Even more exciting was the finding that Black students benefited more from learning about the malleable nature of intelligence than did White students, showing that this intervention may successfully counteract stereotype threat. Both of these lines of research suggest that belief matters. Fascinating stuff. Resisting this large collection of potential availability biases is possible, but tiresome. You must make the effort to reconsider your intuitions… Maintaining one’s vigilance against biases is a chore — but the chance to avoid a costly mistake is sometimes worth the effort. Decision fatigue helps explain why ordinarily sensible people get angry at colleagues and families, splurge on clothes, buy junk food at the supermarket and can’t resist the dealer’s offer to rustproof their new car. No matter how rational and high-minded you try to be, you can’t make decision after decision without paying a biological price. It’s different from ordinary physical fatigue — you’re not consciously aware of being tired — but you’re low on mental energy. As the body uses up glucose, it looks for a quick way to replenish the fuel, leading to a craving for sugar… The benefits of glucose were unmistakable in the study of the Israeli parole board. In midmorning, usually a little before 10:30, the parole board would take a break, and the judges would be served a sandwich and a piece of fruit. The prisoners who appeared just before the break had only about a 20 percent chance of getting parole, but the ones appearing right after had around a 65 percent chance. The odds dropped again as the morning wore on, and prisoners really didn’t want to appear just before lunch: the chance of getting parole at that time was only 10 percent. After lunch it soared up to 60 percent, but only briefly. So, returning to the Kahneman bit, I wonder if we might observe a similar phenomenon with respect to political bloggers. Would ad hominem attacks follow the same pattern throughout the day? Might bloggers who had just eaten have the mental energy to counter their biases, to treat opponents with respect, etc.? And might that ability be depleted as the time between meals wears on and their mental energy is lowered? This could be tested pretty easily by analyzing the frequency of certain ad hominem clues like, say, the use of the word “idiot”, and then checking frequency against time of day. I’d love to see this data, and not just because I want an excuse to snack while I write. You con’t want your result to be a negative number. Kahneman concludes the chapter with an example of how this might be used practically: hiring someone at work. All of this makes me think of online dating. This is an area where we are transitioning from almost entirely intuition to a mixture of algorithms and intuition. Though algorithms aren’t making any final decisions, they are increasingly playing a major role in shaping peoples’ dating activity. 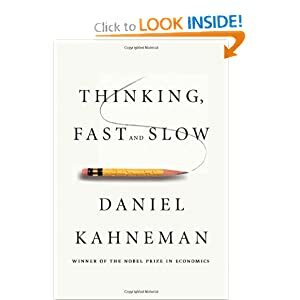 If Kahneman is right, and if finding a significant other is a “low-validity environment”, will our increased use of algorithms lead to more optimal outcomes? What truly excites me about this is that we should be able to measure it. Of course, doing so will require very careful attention to the various confounding variables, but I can’t help but wonder: will couples that meet online have a lower divorce rate in 20 years than couples that didn’t? Will individuals who spent significant time dating online be less likely to have been divorced than those that never tried it? *One might reasonably object that this definition stacks the deck against intuition, and I think this aspect of the debate deserved a mention in the chapter. The focus on “low-validity environments” is the focus on areas where intuition is lousy. So how shocking is it that these are cases where other methods do better? And yet, the conclusions here are extremely valuable. Even though we know that these “low-validity” scenarios are tough to predict, we still generally tend to overrate our ability to predict via intuition and underrate the value of simple algorithms. So in the end this caveat – while worth making – doesn’t really take away from Kahneman’s point. Jane is a ferociously hard-working student who always completes her work well ahead of time. What GPA do you think she graduates college with? Formulate it in your mind, an actual number. So Kahneman explains “intensity matching” as being able to toggle back and forth intuitively between variables. If it sounds like Jane is in the top 10% in motivation/work ethic, she must be in the top 10% in GPA. And our mind is pretty good at adjusting between those two. I’m going to pick 3.7 as the intuitive GPA number; if yours is different you can substitute it in below. Kahneman says this is biased because you’re ignoring regression to the mean, another way of saying that GPA and work ethic aren’t perfectly correlated. so here’s a model to use Kahneman’s trick for taming your prediction. What is the correlation between work ethic and GPA? Let’s guess .3 (It can be whatever you think is most accurate). Now what is the average GPA of college students? Let’s say 2.5? (Again, doesn’t matter). So apply the correlation between GPA and work ethic to the difference between your intuitive prediction and the mean, and then go from the mean in the direction of your intuition by that amount. I played around with some different examples here because my intuition was grappling with some issues around luck vs. static variables, but those aside, this is a neat way to counter one’s bias in the face of limited information. I can’t help but wonder, though, if the knowledge that this exercise was designed to counter bias led anyone to avoid or at least temper intensity matching. In other words, what were your intuitions for the GPA she’d have after just reading the description of her hard work? Did the knowledge that you were biased lead you to a lower score than the one I mentioned? Here’s what I’m getting at… If it’s possible (and this is just me riffing right now) to dial down your biases (either consciously or not) when the issue of bias is on your mind, it would seem possible that one’s intuitions could be dialed down going into this exercise, at the point of the original GPA intuition, which could ruin the outcome. Put another way, the math above relies on accurate intensity matching which is itself a bias! If someone were able to come into this with that bias dialed down, they might actually end up with a worse prediction if they also did Kahneman’s suggested process.